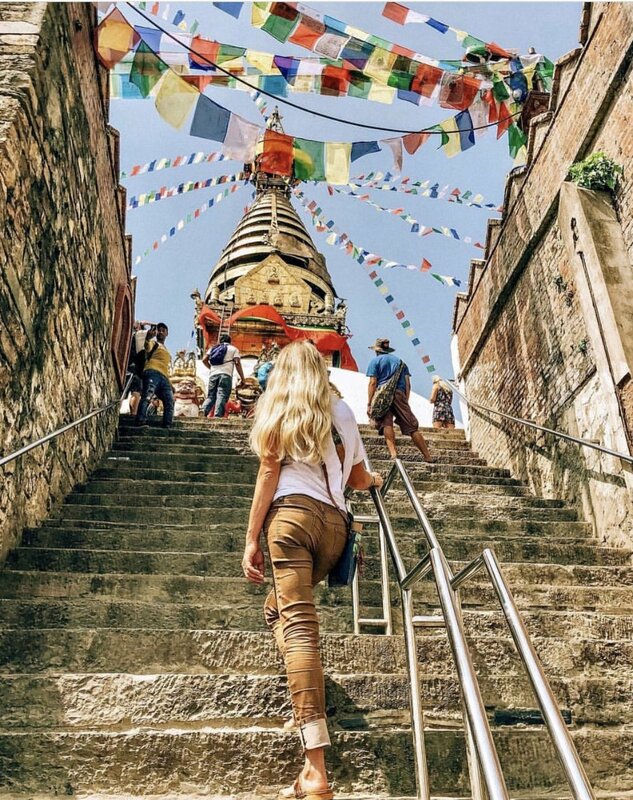 Explore the ancient city of Kathmandu and learn about Buddhist and Hindu traditions and culture. Accomplish a bucket-list item: Trek to the Base Camp of Mount Everest, the highest mountain in the world! See the stunning Himalayas, up close and personal. Start from the small, high, mountainous airport of “Lukla” and from there, begin your Mt. Everest Base Camp adventure. Throughout the trek, enjoy the beautiful scenery of mountains, villages and rivers while learning about the culture and lifestyle of the highland Sherpa people. We will work with the best local service providers and most experienced guides in the Himalayas. Experienced and licensed local English-speaking guide/porters. Welcome dinner and breakfast in Kathmandu. All meals (3/day) during the trek. National Park entrance fee and Trekkers’ Information Management System. Water purification tablets. Pulse rate and oxygen saturation check during the trek. Arrangement of emergency evacuation service. Spa service upon return to Kathmandu. Daily guided meditation and/or gentle yoga. Investment for this life-changing adventure and everything mentioned above is $2299. 1st deposit of only $100 due promptly to reserve your space as spaces are very limited for this private group trek. 2nd deposit of $400 is due 6 months prior to Trek. Final balance due 90 days prior to Trek. *all deposits are non-refundable. Nepal is home to the beloved Everest base camp trek: one of the most challenging and rewarding treks in the world. Despite its popularity as a travel destination, Nepal is one of the poorest undeveloped nations in the world, with over 25% of the population living beneath the poverty line. Many Nepali families cannot afford education for their children who grow without any opportunity for career development. You can change that! We have teamed up with the Volunteer Initiative of Nepal to help provide a better life for the children of the Himalayas. Your trek will cover a year’s worth of education for one child. After flying into Lukla, we stay at tea houses along the trek. A tea house is a combination of a guest house, restaurant, and social hangout. 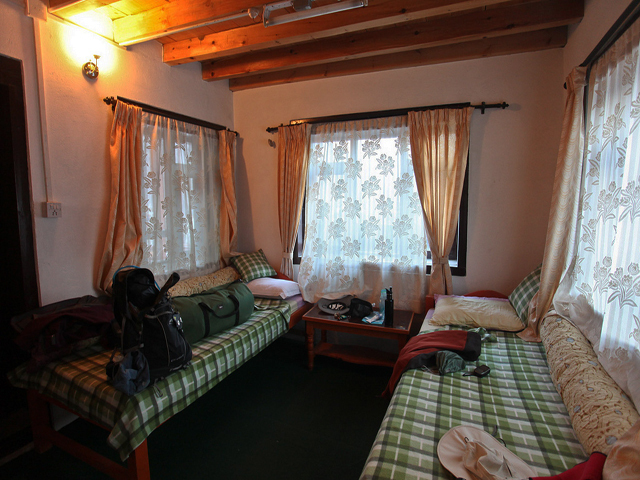 The rooms are very basic, with two twin beds and very little additional furniture. Blankets or comforters are generally provided. Most bathrooms are shared with others; a private bathroom will only be available at some lodges at lower altitudes. The majority of tea houses only provide cold showers. A few may have hot showers available at additional cost. Some tea houses also provide Wi-fi and an electricity charging service for cameras and phones for a small fee. During the trek, you will have breakfast and dinner at the tea house where you stay for the night, and lunch at one of the trail side restaurants. Every tea house serves a traditional Nepali meal of Dal Bhat (unlimited refill of rice, veggies and potatoes! ), as well as a variety of different food items, such as noodles and soup. Some have Nepali versions of western food such as pizza, pasta and French fries. Soft drinks, snacks and beer are available in most of the tea houses and trail side restaurants. And, of course, Nepali milk tea is served everywhere. Are you ready for a unique and epic journey of self-discovery? Is this trip right for you? Although no climbing or mountaineering experience is necessary, prior trekking experience is highly recommended. This trek is rated 5 - Challenging, including high-altitude hiking and 4-7 hours trekking each day. You must be fit and should be in good health. Please visit your family physician before your trek. The challenges of this demanding trek provide the perfect opportunity to lean into your deepest fears, conquer physical & mental challenges, forgive your faults and forgive others, learn to accept & love others just as they are while finding that same acceptance & love for yourself; leaving you feeling deeply connected to the heart of who you truly are. I am honored and privileged to share this extraordinary adventure with you as you make your way towards the base of the world’s tallest peak while connecting to the deepest parts of your Soul. Questions? Concerns? I’d love to share more details with you about this extraordinary adventure! Contact me by clicking on the link below!